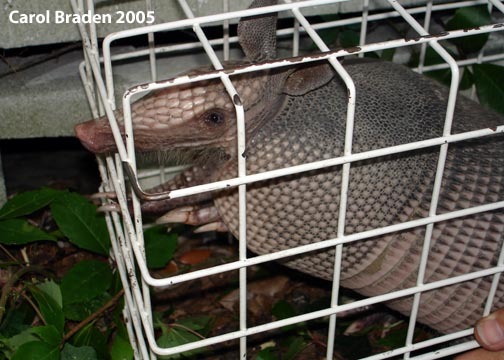 Armadillos: Funny animals, or destructive pests? Not everyone thinks armadillos are great. In fact, armadillos can cause some major issues with (and generate some strong language from) homeowners, gardeners, farmers, and anyone else who feels less than pleased to find one of these small digging machines wandering about the yard. Keep reading for some specific bits of advice to help you curb your armadillo problems. Armadillos are really unique animals. Usually, they are not a problem for people, but occasionally they can be a major pest in suburban and agricultural areas. I have gotten lots of mail from people asking me what they can do to get armadillos to leave their gardens and lawns alone! In their voracious search for insects and grubs to eat, armadillos can dig up quite a bit of land in a night. The pictures below are just a few examples of what a hungry ’dillo is capable of. In South America, the giant armadillo is often a major agricultural pest. This large edentate has very strong legs and claws for tearing apart termite mounds — but they also come in handy when rooting around for food in a farmer’s field! So, what can be done about these marauding mammals? Unfortunately, not a whole lot. Capturing the armadillo is one option, and it has worked for some people. Keeping armadillos from entering your yard in the first place is also an option. Read more below to learn how to deal with your own particular armadillo problem. Remember, if all else fails, you can always rely on a professional animal removal service. The best solution (and the most expensive) is a stout fence to keep the armadillos out. If you take this route, make sure the fence is extended a foot or more into the ground, or the ’dillos might just burrow under it. You can also try an ultrasonic pest deterrent device. A few different models promise to remove armadillos, skunks, and other visitors from your yard. A less expensive method (that won’t annoy your dog or cat by accident, as an ultrasonic device can do) is to simply make the areas they dig in smell bad to the armadillo. Armadillos have sensitive noses. (The armadillo’s olfactory bulbs — the part of the brain that detects odor — is about 1/3rd the size of their cerebrum, the part of the brain used for thought, learning and memory.) Anything with a strong, noxious odor can help evict an armadillo from a den. Mothballs have been used successfully in the past, and I have also heard that some armadillos do not like the smell of pine needles or pine mulch (they avoid foraging in areas with needles). Placing mothballs around the areas you most want to protect can keep pesky burrowers away. Peppering your whole lawn with them might be a bit drastic, but they might help you save your flower garden. 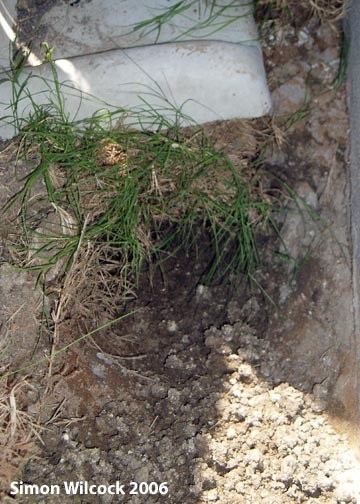 If you have an animal burrowed in your yard or under your house, you probably want it to leave. The simplest method of removal would be to try something with a strong odor to encourage it to move out. Dropping mothballs down the hole might help evict it, although one reader reported that the armadillo just threw the mothballs back out. If that doesn’t work, you could always try a rag soaked in vinegar or ammonia (anything with a mild form of ammonia, like Windex, should be enough to do the trick — if it smells bad to you, it ought to smell absolutely awful to an armadillo). If you have an armadillo under your foundation, you may need to take additional steps to make sure your visitor leaves and does not come back. The best method is to build a “trap door” that will allow the armadillo to leave, but will not let it back into the burrow. 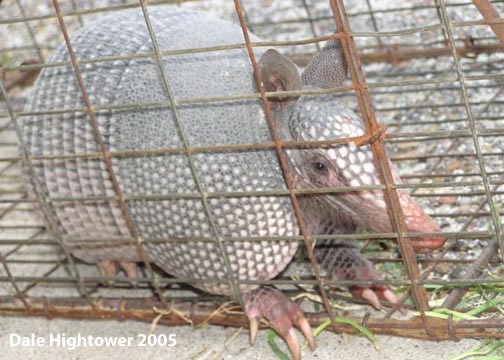 A heavy cloth or lightweight section of wire mesh fencing placed over the hole and secured loosely at one side should allow any armadillo still inside the burrow to push its way out, but it wouldn’t be able to re-enter very easily. Combining the trap door with something smelly ought to double your chances of a successful removal. If the armadillo that is causing you problems doesn’t live in your yard, or if you can’t find the burrow, you might consider trapping it. Armadillos are usually active early in the morning or late at night. You can either get up early or stay up late and attempt to net the critter if you see it, or you could get a normal amount of rest and let a live trap do the work for you. 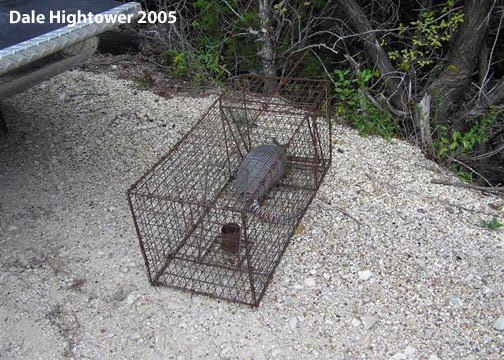 If you would like to try a live trap, first make sure it is big enough to hold an armadillo. They are around the size of a large cat when fully grown. Bait the trap with fresh fruit or earthworms. Worms probably will work the best; fruit might just attract a raccoon instead. If you use worms, put them in a nylon stocking. This will let the smell out without letting the worms escape. 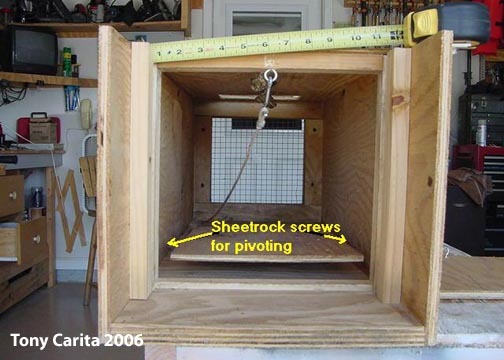 If you don't have access to a live trap, you could also build one yourself. 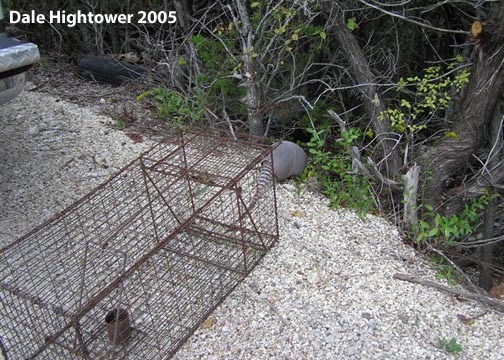 One reader sent in photos of his own home-built trap; it helped him remove more than one troublesome armadillo from his own yard — and he has the photos and videos to prove it. 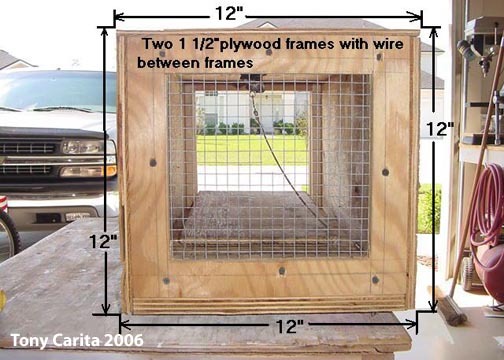 The trap is 12 inches high, 12 inches wide and 36 inches long, constructed of scrap plywood and wire mesh. 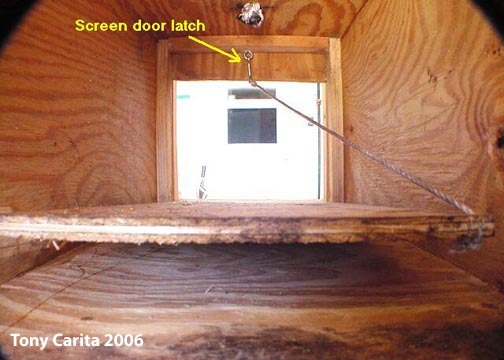 The bottom of the trap has a simple rocker platform; when an animal steps on the rocker, the latch holding the sliding door of the trap is displaced, allowing the door to slide shut and trap the animal. 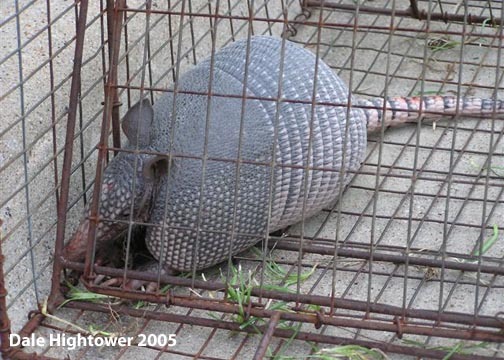 Once you've trapped your armadillo, you can release it away from your yard. To stop it from coming back, you can release it somewhere it is likely to be happy. Try to let it go near water — a lake, stream or pond will do. There should be some amount of brush or other cover nearby for it to hide in. I should warn you that relocation doesn’t always work, though. Armadillos are not strongly territorial, and the one you are removing today could be the one who was digging up someone else’s yard the day before. They tend to wander about looking for food, so action taken against one particular animal might just create an opening for another one to wander on in. After you’re sure your visitor is gone, fill in the hole. If you start by plugging the entrance loosely, and then monitor it daily, you will avoid trapping an animal underground, and you’ll be able to see if it has come back to re-open the burrow. After several days of no noticeable disturbance, you can safely refill the hole with a mixture of earth and pea gravel, to make it harder to dig open again. If you had an armadillo under your foundation, you may need to take additional steps to make sure your visitor does not return after you have evicted it. Once you’re sure that it is gone, plug the entrance loosely as described above. After monitoring for a few days to make sure it is gone, plug the hole securely. 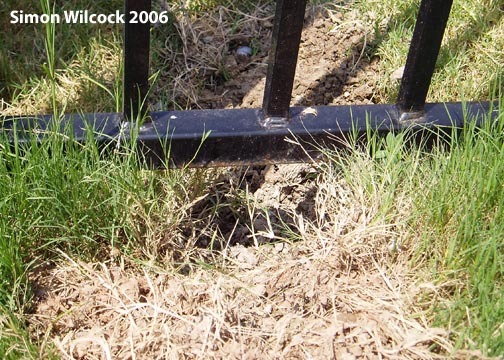 To keep it from returning, you can bury an L-shaped section of fencing against the foundation, to keep the armadillo you removed (or any other animal) from burrowing back under the house. Hopefully this will help you solve some of the more common armadillo problems. If your removal attempts are unsuccessful, please remember that armadillos in your yard are not always a bad thing. They tend to leave larger, established plants alone, and they keep insect and other pest levels down by eating them — a much more environmentally friendly way of pest control than using chemicals in your garden. The digging also tends to aerate the soil, allowing more atmospheric gases (nitrogen, oxygen and carbon dioxide) to reach the roots of the plant, which encourages growth. If you really can’t handle having an armadillo in your yard, you could always move to a state that does not have armadillos — but be sure to check the Armadillo Expansion page before you decide you are safe, because they are moving north! Want more answers to your armadillo questions? Check out the Armadillo FAQ page.